BRIDGEPORT — Blink and you'll miss it, but behind the big iron doors on Morgan Street is one of the neighborhood's hidden gems. The "Life's Garden" at 3302 S. Morgan St. was created in 1999 by ShanZuo and DaHuang Zhou, two brothers and renowned artists who emigrated from China and have called Bridgeport home for decades. The brothers starting renting out the garden in 2008. Since then, it's become a desirable destination for weddings and private parties, like baby and bridal showers. "It's a great little nook you wouldn't typically find in Bridgeport," said Stephanie Galvin, a spokeswoman for the brothers, who live just a couple of doors down from the garden and often work and host family dinners there. The Zhou B Art Center, the brothers' massive art center at 1029 W. 35th St. is just a short walk away. When the garden isn't serving as the brothers' tranquil workplace — they always work together — it often becomes an elegant wedding backdrop. For a bride's entrance, "we open up the wrought iron gate. It's pretty dramatic and beautiful," Galvin said. Galvin said she booked up to 20 ceremonies per summer at the garden, which features manicured topiary, a koi pond and sculptures. The adjacent art gallery displays some of the brothers' older work. The grounds are maintained by Zhou B employees, including some of the artists who live in the buildings on either side of the garden. 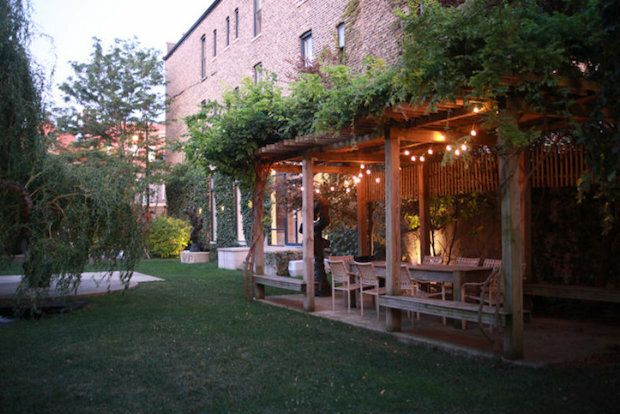 The grounds can seat up to 150 guests or 200 people for a cocktail reception. They can be rented together for a fee ranging from $1,500 to $3,500, depending on the day of the week and other amenities. The facility is catered exclusively by Kenmare Catering.